"A guy living alone will go to the same place to eat every day just so people there will get to know him. It's an identity thing. Keeps him from being nobody and almost makes him somebody." "Most things you do in life don't count for nothing. Let's say you go fishing and catch a really big fish. What does it mean? Nothing--unless you're starving. The things that do count are in the way you react to people you got some kind of influence over, like your wife and kids. When the kids are young, practically everything you do with or to them is significant. You kiss a woman, usually it counts if she thinks anything of you. But a cruel word--one word, mind you--can cut her to the core. That's why I wish I'd been better to my family. But there are no second chances. The kids are grown, and the wife's gone. God rest her soul." "I once caught a guy stealing toilet seats in the old Hotel Manger. â€˜What the hell you taking those for?' I ask, and he says, â€˜I'm building things with them.' I stare at him. â€˜What kind of things?' Without blinking an eye, he says, â€˜Portholes.' I didn't arrest him. It was too late in the day. And mentally I gave him A for Improvisation." anymore, but young guys in the neighborhood get a kick out of it. They think it's something new." "My father is kind of shriveled up, got a face like a fist, but he can still fend for himself, and that's what matters. I see him every week, depending. We don't say much; we don't have to. We've said it all. He misses my mother the way I miss my wife, but neither of us goes to the cemetery. A tombstone is a door you knock on and nobody answers. Silence is the world's saddest sound. Trust me on that." "When I wake up at night and can't get back to sleep, I lie there with all these images of my wife when she was young, and I hear Peggy Lee singing Just for the Thrill. Or sometimes it's Sinatra belting out I've Got You Under My Skin. Only time I saw Sinatra perform in person was down in Providence when his voice wasn't all his anymore. In fact, it was embarrassingly bad. Can't tell you how old that made me feel--Old Blue Eyes going sour. I wanted to cry. Not for him. For me." "I figure my wife and mother are safe and sound in Heaven, a gated community, though at times I worry. My experience tells me malcontents are everywhere, so there're probably some up there causing trouble." "I can always tell a guy who's eaten all his life in greasy spoons. Something about his skin. It don't look like ours." "Something else I've noticed. A girl goes with a guy long enough, she starts looking like him. He's got a sour expression, she grows one. Take my married daughter. She don't look like her side of the family anymore. She looks like his." "My middle son is a certified public accountant working for a big firm on Broad Street. But do you want to know something? He hasn't set foot in a barber shop in years. His wife cuts his hair. What d'you think of that? Kid makes over a hundred grand a year, and he gets homemade haircuts. That's another case of two people looking alike. His hair looks like hers." "All my years as a cop, the thing I learned most is the poor get poorer and the dead get deader. It's what you call a fact of life. Another fact is that people you think have forgotten you will probably attend your funeral, if only to show they're still alive and kicking and show sympathy that you're stone cold." "I've got a confession to make. I cried--though not so you'd know it--when Sinatra died and again when Peggy Lee did. Members of the family, that's how I regarded them. I always thought Peggy Lee was Polish, like my wife, but the obituary said Swedish, plus Norwegian. To me she'll always be a Polack." "Life is long only while you're young. I can't imagine myself gone. I wonder if I'll miss myself. Then I realize how easy the world will go on without me, won't miss a beat. Plenty more where I come from." "What I can't get through my head is this: When you die, why does it have to be forever? Why can't it be just for a good rest? You wake up, you feel twice yourself." "A partner of mine who doesn't believe in anything told me immortality is a poetic word, a metaphor for wishful thinking. I told him to shut up, I got enough on my mind. He went to law school nights, passed the bar on the first try, and became an ambulance chaser. To each his own." "I've come up against plenty of hoods in my time, including some crazy killers, but I'll tell you what scares me most. That's a drunk driver. If you're on the road with one, he's going to get you, and nine times out of ten he lives and you die. I know. I lost a pal that way. And I'm the one had to tell his wife while trying to avoid looking at his kids." "The biggest weapon in the world, as far as I'm concerned, is a sawed-off, double-barrel shotgun. The only time I ever saw one used, I thought the whole building was coming down. I still got the noise in my ears, but I never put in for disability. I learned to live with it." "When you've been a cop long as I have you've seen just about everything bad people do to one another. Ugly cruel stuff, and you have to ask yourself why God permits it. The only answer seems to be He looks the other way. I told my priest that, and he told me to say a bunch of Hail Marys. Like I was a little kid." "Far as I can tell, most people, especially homicide victims, die with their eyes wide open, like they're grabbing a last look and trying to freeze it. My time comes, I want it to be in my sleep, my eyes shut, and if I'm having a sweet dream, so much the better. Maybe I'll have a smile on my face." "I had mixed emotions about retiring, but I was glad to turn in my piece. I never trusted anybody walking around with a loaded revolver, and that included myself. Besides, the older you get, the heavier your past. Soon it weighs more than you." "If I had to do it all over again, I'd still be a cop. But if you asked me why, I couldn't tell you." Copyright 2008, Andrew Coburn. © This work is protected under the U.S. copyright laws. It may not be reproduced, reprinted, reused, or altered without the expressed written permission of the author. 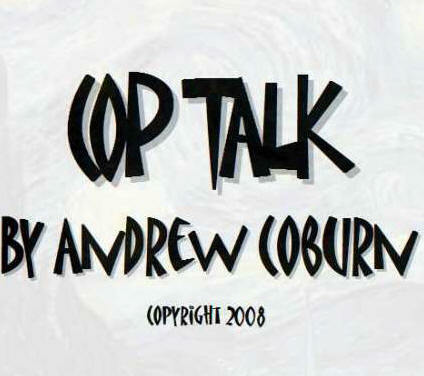 Andrew Coburn is the author of 12 novels, three made into French movies; work translated into 14 languages. His novella, My Father's Daughter, is included in a collection of American and British authors published in the US, UK, France, and Italy. His short stories have appeared in numerous journals, including the now-defunct Transatlantic Review. He and his wife Casey, an editor and writing teacher, live in Andover, Massachusetts.